MEMOFIN - Comparison of liability regimes in Member States in relation to the Prospectus Directive - L'information financière que vous ne trouvez nulle part ailleurs ! The European Securities and Markets Authority (ESMA) has published a report on the Comparison of liability regimes in Member States in relation to the Prospectus Directive. This is the first report of its kind and provides a comparison of liability regimes covering the EEA – comprising the 27 EU Member States along with Iceland and Norway and is aimed at providing clarity for market participants about the different regimes in place. 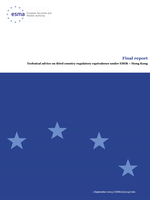 The report contains an overview of the different arrangements and frameworks in place in EEA States to address administrative, criminal, civil and governmental liability, and provides clarity to market participants about the different regimes in place. The report was compiled in response to a European Commission request of January 2011 for assistance in identifying and monitoring the different regimes in EEA states. The report does not cover how the regimes, or sanctions, are applied.